The Cypress Police Department received multiple 911 calls reference a residential structure fire at the Cypress Mobile Home Park located at 4861 Lincoln Avenue. Officers arrived on scene within three minutes and were advised that one victim was burned and another was unaccounted for. Two Officers began a search of the area for the missing person and located the individual attempting to extinguish the fire. 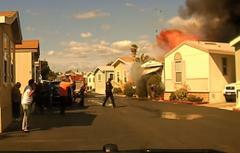 Due to the intensity of the fire they escorted the subject away from the residence seconds before an explosion occurred. Firefighters from the Orange County Fire Authority arrived shortly after the officers and were able to extinguish the fire before it spread to adjacent units. As of this release, one victim is being treated for burns sustained as a result of the fire. Investigators from the Orange County Fire Authority are investigating to determine the cause of the fire. The attached video was captured by the officer’s patrol car video system.